November 14, 2018 -- Lung imaging software developer Vida Diagnostics plans to launch LungPrint Discovery, a new software application designed to help radiologists interpret and report CT lung images, at the RSNA 2018 meeting later this month. LungPrint Discovery provides tools that perform quantification of lung physiology and function, including the analysis of both tissues and airways. It also includes a novel airway visualization tool that the company calls Hyperion View to speed up the interpretation of complex lung anatomy. 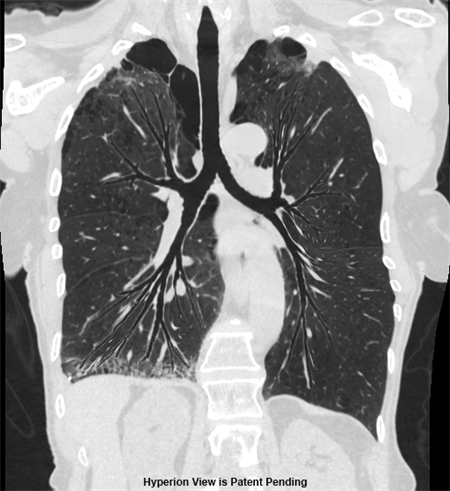 The tools that radiologists currently use to interpret images of lung airways can be cumbersome, and they rarely enable a full view of the lung in one image. LungPrint Discovery uses Hyperion View to segment and identify all of the airways, while its airway view provides visualization from the trachea to the peripheral branches in a single image. LungPrint Discovery's Hyperion View provides visualization of the lung in a single image. Image courtesy of Vida. LungPrint Discovery also includes other tools such as data on density and biomarkers for disease that are quantified for each lobe of the lung. Images and data are included in two-page reports designed to enable radiologists to provide quantified measurements of lung characteristics and, thus, better reports to referring physicians. Vida believes the software will be well-suited for interpretation and reporting of a variety of lung pathologies, such as chronic obstructive pulmonary disease, asthma, bronchiectasis, and interstitial lung disease. Vida is positioning LungPrint Discovery as a tool powered by artificial intelligence (AI) that uses AI to address a specific clinical application. The company plans to market the software through AI ecosystem providers such as EnvoyAI, Nuance Communications, and Blackford Analysis. The software has regulatory clearance, with sales expected to start in early 2019.